The Company receives the 2012 DCE Championship flag. The Company is a repeat Drum Corps Europe (DCE) Champion, taking the gold medal Saturday, Sept. 29 in Kerkrade, The Netherlands. First performing in 2010, the corps from Barnsley, South Yorkshire, England posted its first DCE Championship just a year later in 2011. Winning their second this past weekend, the Company bested second place Kidsgrove Scouts, 87.15 to 85.60 on a scale of 100 points. The corps Tweeted after winning the Championship: "European Champions 2012. Thank You for all your kind words and messages of support - it means so much to us all. CO2012 alright champs." The Company's 2012 production, "Red Riding Hood." The Black Knights of Gravesend, Kent, England took third place with a score of 85.35, marking the first time in DCE history that British corps have finished in the top three spots at the Championship. The Netherlands' Jubal, a corps that participated in the 2011 Drum Corps International Tour in the United States, finished in fourth place. 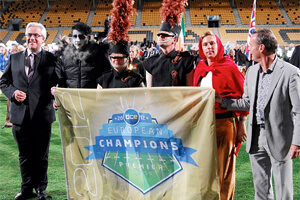 Drum Corps Europe reports that 2,500 fans attended this year's event at Parkstad Limburg Stadium. Adding to that number, the organization provided a live webcast of Saturday's performances that has been viewed more than 13,000 times. Nearly doubling their webcast audience from last year, DCE's digital media coordinator Rob Beeren said, "We have worked incredibly hard with a great team of people within DCE to raise the webcast to a higher level. We want to show the great things happening in Kerkrade to as many people as possible." Read more about the 2012 DCE Championship. Watch a replay of the webcast of the DCE Championship. Photo courtesy theco.org.uk.